Welcome to our discussion pages. Here you will find past and present resources that you can use as part of a talk, a debate, a conference, a workshop or a meeting to plan events. We shall be adding further resources including more suggestions of stories, video clips and films to promote discussion. Please come back for more! If you have any suggestions you'd like to share - please let us know. 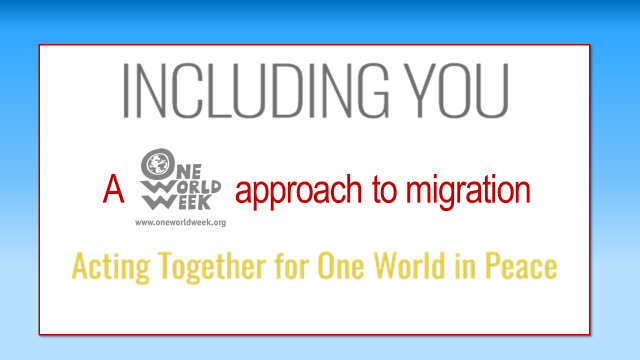 A presentation about a OWW approach to migration and building a culture of inclusion. Looking for a speaker at your event ? A collection of quotes about Sharing Destiny - includes suggestions about how you can use them to stimulate thinking, as eyecatching publicity or to start a discussion. is designed to help you explore the theme with your organising committee; it offers ideas about what you might include in your event and links to resources and other organistions that you could work with. contains much of the same material but it is ready to use as a presentation at your event. 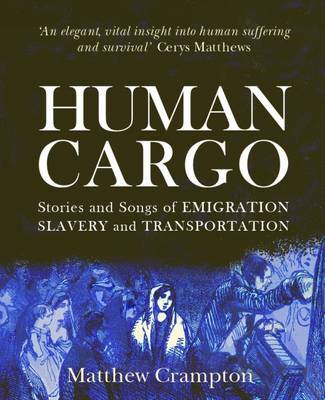 It would make an excellent discussion starter and contains information and ideas for action. Which of the Powerpoints in the table below should I download? Please use the table below to find the necessary file. The PPT files are large so may take a few minutes to download. The PPTX files are much smaller. There are difficulties using them with the Internet Explorer search engine, but it's fine with Firefox and others. - A culture of peace – What is it, how do we create it? 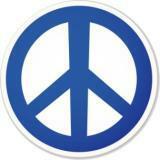 - What does peace mean to you? 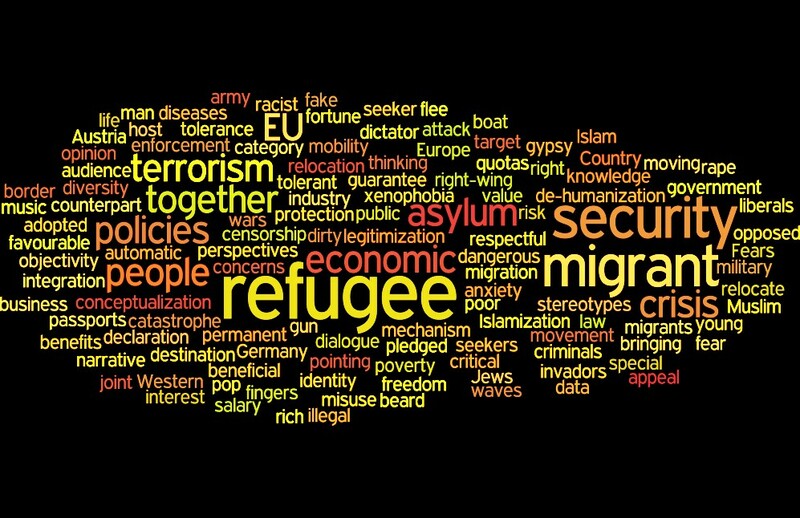 Learn about widely recognised peace symbols and then follow our questions and tasks to have a lively and interactive discussion concerning the power of symbols in society. There is also a facilitator’s version of the questions, which contains additional information and prompts that can be used as starting points if discussion is limited. Be aware of your power to make a difference. Remember, peace is not just an absence of war; it is also environmental stability, economic and social justice, and understanding. Use the information provided in this resource to discuss how even small actions can have a significant, and sometimes far-reaching, effect on establishing peace. There are also a number of suggestions of other activities for peace pledges. 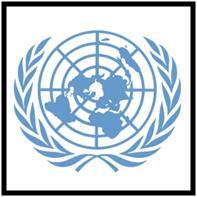 This UN initiative, which finishes this year, has inspired One World Week’s theme for 2010, 'Peacing Together One World - Creating A Culture Of Peace For Our Children'. Download a summary of the aims and progress of the decade here. One World Week has chosen to focus on 3 points: Promoting sustainable economic and social development, promoting respect for all human rights, and advancing understanding, tolerance and solidarity. These points are in line with our aims and vision. 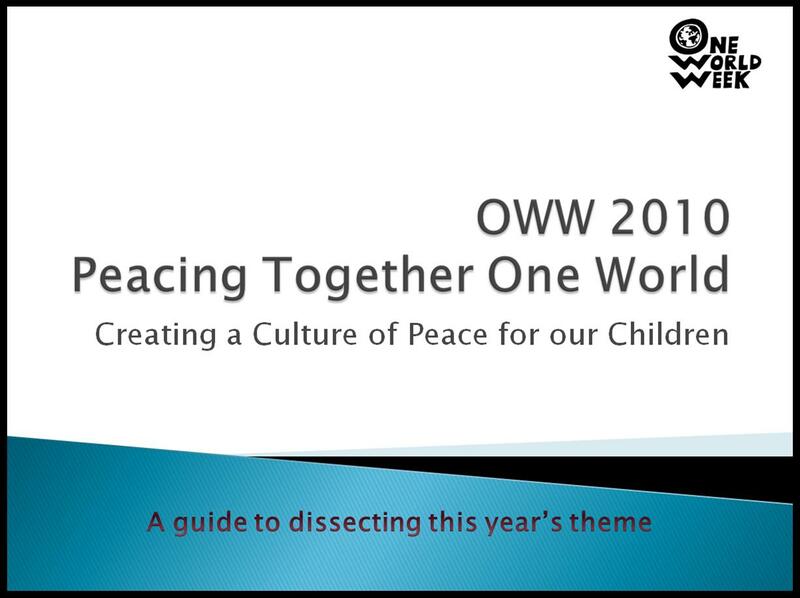 OWW has also developed a PowerPoint presentation entitled ‘A guide to dissecting this year’s theme’ which looks at the decade and how to create a culture of peace for our children. Find it at the top of this page. 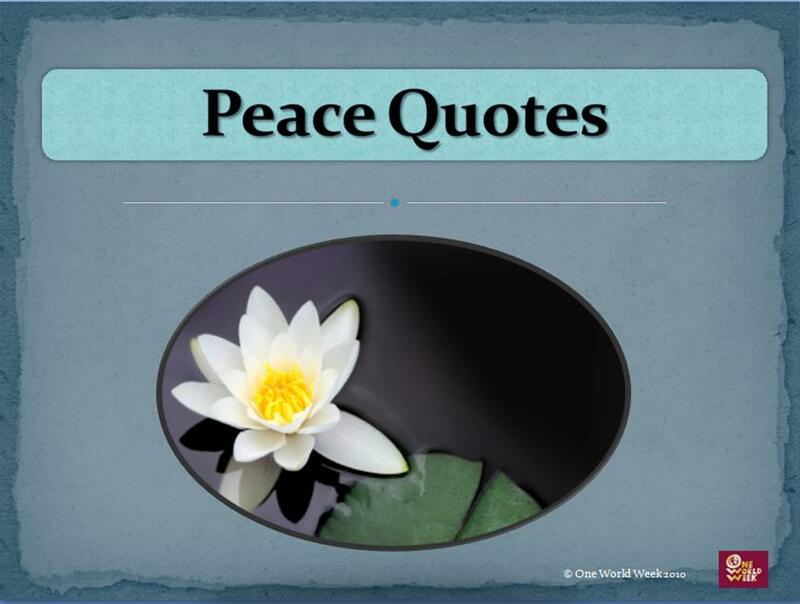 This PowerPoint presentation offers a variety of quotes about peace and justice. Phrases have been selected from religious scriptures, recognised holy figures, and well known establishments and people who have an opinion on peace and justice. Use this resource as a starting point for discussion on multifaith and secular approaches to peace, as a rolling background during an event, or even mix all the quotes up and try to work out which category or faith perspective they are from. 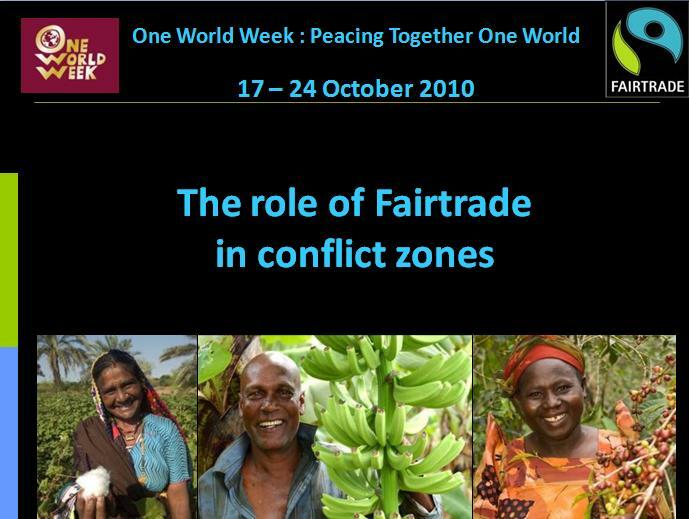 This PowerPoint presentation explores the role that Fairtrade plays in areas affected by violence. The presentation looks at the ways in which Fairtrade helps people living in conflict zones and the contribution economic development makes towards resolving conflict and restoring peace. 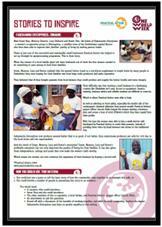 Produced jointly by the Fairtrade Foundation and One World Week. 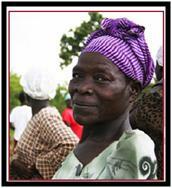 Villagers in Uganda grew coffee but despaired of the low prices they received for all their hard work. The villagers included Jews, Muslims, and Christians who tolerated each other but were not close. In 2003 they came together to form a co-operative; they have been working together ever since to improve their coffee production and their lives. This is an adaptation of the service written for OWW 2007, by Jo Rathbone, of Eco-Congregation, with additional materials and suggestions from OWW to make it appropriate for the 2010 theme. In this section, we have archived a selection of true stories. 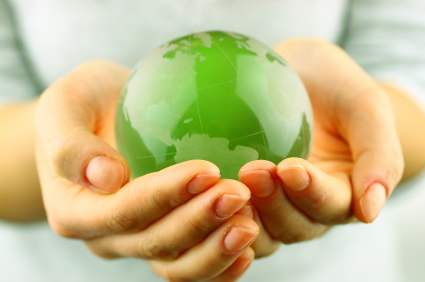 Some look at the impact of climate change, others feature Fairtrade producers, while some look at how ordinary people from all over the world have brought their communities together in the face of adversity to create a better life for themselves and those around them. A DVD of a determined, environmental activist woman in Kenya. 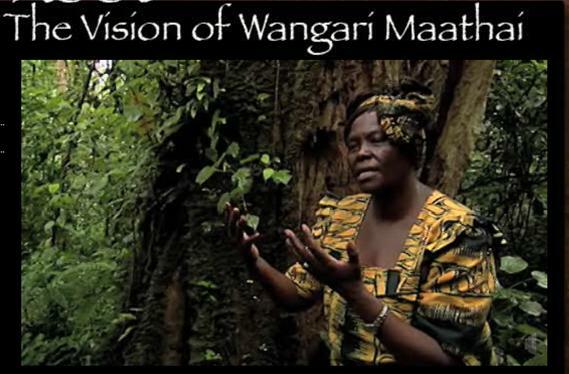 Wangaar Maathai is the first African woman to be given the Nobel Peace Prize and wants "to bring the forest to the table at Copenhagen". WARNING - North American DVDS are not always compatible with UK equipment - Check before purchase. 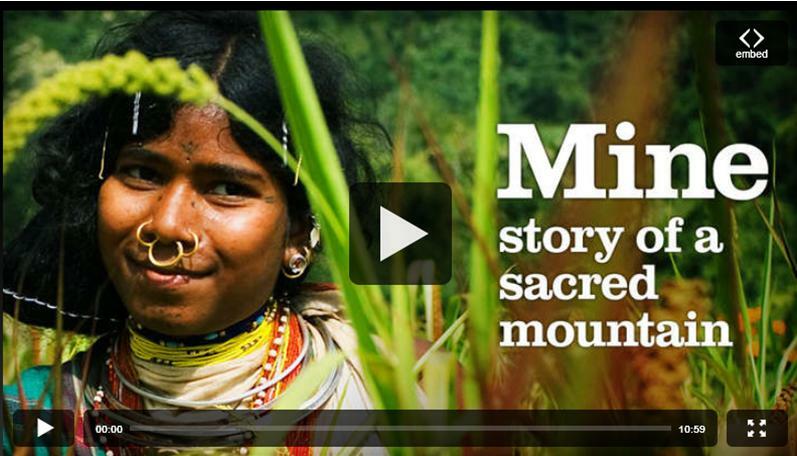 The Dongria Kondh tribe in the Niyamgiri Hills, India want to protect their forests, rivers and mountain. These are under threat from a London-based mining company. To find out more watch their story and campaign.